Mohamad Jamal Khewis, via Kurdistan24. The American who joined ISIS and was later captured by Kurdish forces said he “made a bad decision” and no longer supports the terrorist group. 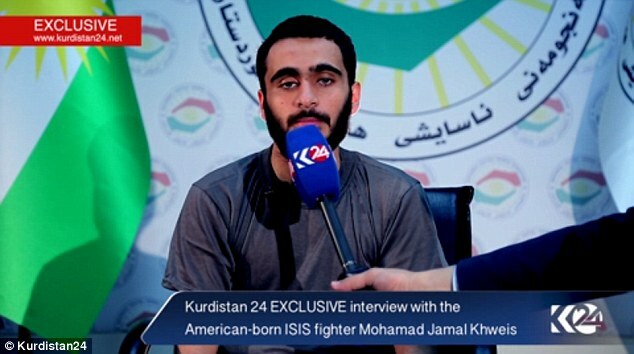 U.S. law enforcement officials plan to interview Mohamad Jamal Khewis, 26, in hopes of getting information about how ISIS operates, The Daily Mail reports. Khewis didn’t say why he joined ISIS, but indicated that he traveled to Syria from Turkey after meeting an Iraqi girl. The Justice Department is planning on charging Khewis. Posted: 3/18/16 at 9:20 AM under News Story.